Another month and another pair of mittens designed and knit! 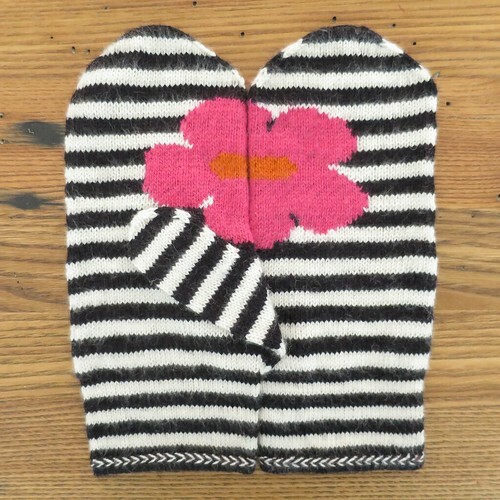 Last month, I did the April Showers Mittens which of course led to this month’s May Flower Mittens. I’ve had the idea for these in my head for awhile, I wanted them to be graphic like pop art and I wanted the flower to wrap around the hand so when you held your hands together you got a full flower. I struggled with the flower shape, but then this last Iron Craft challenge fixed that. We were to be inspired by art and I saw Andy Warhol’s Flowers, there was my flower shape inspiration. I love the hot pink and orange against the black and white. It’s sure to bring a little spring color to even the gloomiest winter day. This was my first time doing a Latvian braid! It is pretty simple if you are used to doing stranded colorwork, you are just doing the twisting of the yarn on the front of your work. I gave basic instructions, but there are some good tutorials online. I used this one from Ohdessa Knits. I will admit this pattern is a little but fussy with the colorwork. I had originally planned to do intarsia in the round, but it wasn’t giving me the smooth look where you turn your knitting, especially with the stripes. What I ended up doing was a bit of a cheat, I knit the mittens in the round up until the flower started and then I knit that section flat. I seamed it up and continued the rest of the top of the mitten in the round. I just didn’t want to strand the pink and orange all the way around the mitten. Finally, I used the method I show here to get jogless stripes, which just look so much nicer. 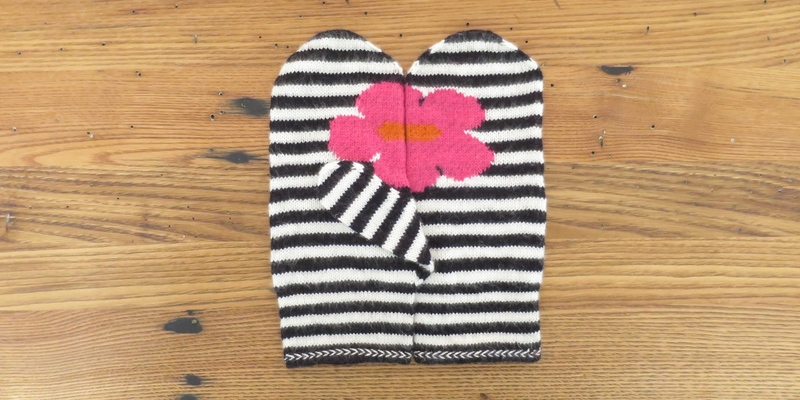 Download the May Flowers Mittens Pattern (with chart) or download the May Flowers Mittens Chart only. Follow chart for color changes and intarsia pattern. The same chart is worked for both hands. I chose to change the direction of the Latvian braid on the second mitten by switching the order I did rows 4 and 5, but that is optional. Cast on 76 in black with 00 needles. Divided between three needles. Join together to knit in the round placing a stitch marker between the first and last stitch to make rows. Row 4: Pull both yarns forward with black on top. Purl into each stitch with its matching color floating the other color over the working yarn. Row 33: k39, m1l, k1, m1r, k39 (81 stitches) You may find it easier to keep track of where the thumb stitches are if you place a stitch marker before the m1l and after the m1r. Cut the yarn leaving about a 10-inch tail. Finish the hand with kitchener stitch. These mittens have not been test knit by anyone but myself, so if you run into an error please let me know. Thank you, I know knitting isn’t for everyone. The flowers and colours are so nice. 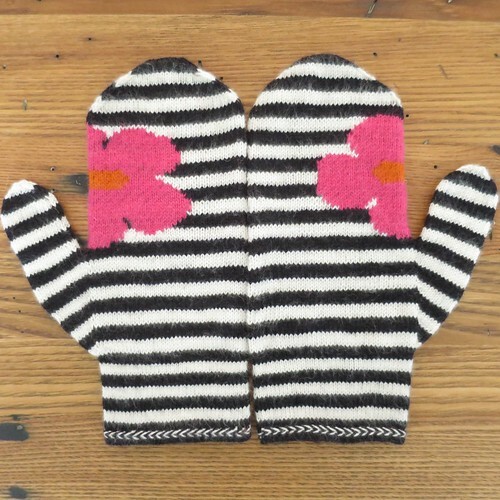 I have been wanting to learn to make mittens and these are so cute, I think they will be my first pair! Do you have a link to size of mittens so I will know if a large would fit me? Thank you! I’m not sure what you mean to a link to the size, but the mittens are 8″ around at the widest part. So measure your hand or another pair of mittens to see if that is right for you. As for length, you can see in the pattern I have you start the decreases for the thumb and hand based on where they hit on your hand (ie: top of the little finger).